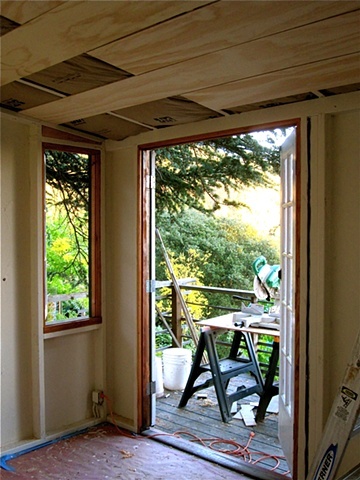 My Studios are built with wood framing and board and batt siding. They are sturdy, light weight, and quick to build. I like to use recycled windows and doors, not just for economy, ecology, but also for charm as well. Usually the framing is left exposed, and it may be painted or not. Stud bays are often the beginning of bookcases or storage units. Without a wall finish a smalls pace feels a little larger.